To Register On-Line: Click the "On-Line Registration" button and follow the prompts to create an account, enroll students in classes, and make payments. If you have any questions or need assistance, call the office during business hours. To Register in Person: Register in the office Tuesdays and Thursdays, 4:00-6:30 pm and Saturdays 11 am - 4 pm. (There is no registration on Saturday during July and August.) For more details about each program, read the information below, or visit the Program pages. If you have questions, fill out and submit the form below. Copies of the registration forms can be downloaded from the links on the right side of this page. Full-year classes begin in October and end in May with a recital. Registration begins the previous June, and continues until January if space is available in the class. Students are grouped according to age for younger dance classes. Students ages 11+ are grouped according to ability. 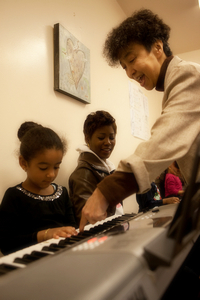 Private music lessons begin in October and end in May with a recital. Registration begins the previous June, and continues through the school year if space is available in the teacher’s schedule. Group music lessons begin in October and end in May with a recital. Students are placed in groups according to age and ability. Registration begins the previous June and continues until January, if space is available in an appropriate group. Full-year classes begin in October and end in May with a presentation and ceremony. Registration begins the previous June, and continues until January if space is available in the class. Students are grouped according to age and ability. Recruitment for participants ages 14-20 begins in the fall. Students submit a completed application and attend an audition. Selected applicants attend workshops twice weekly throughout the school year. Applications will be available in September. If you have any questions, please fill out the form below and submit it, or call 718-652-6256.